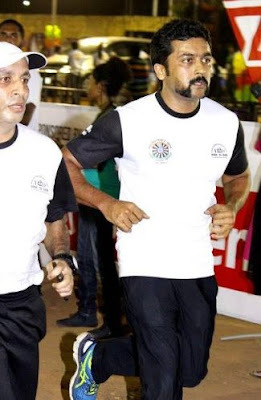 The ‘Dusk to Dawn Chennai Night Marathon 2015’ was flagged off at the Island Grounds by Actor Surya, at10.10pm. This initiative to help underprivileged children through the project Freedom through Education saw over 3500 participants with the age as low as 6 and 75 plus. 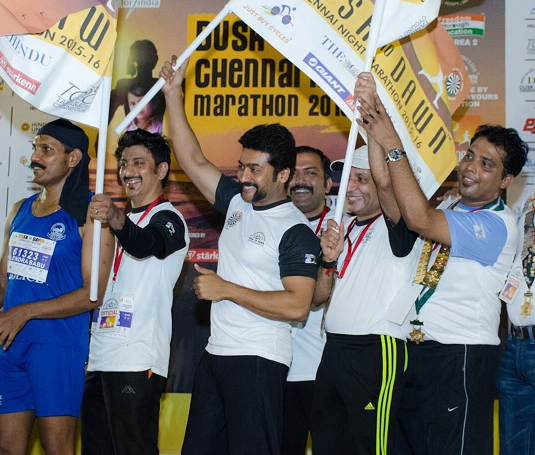 After flagging-off all the events, Actor Suriya also ran the D2D Marathon along with Neville J Bilimoria, for 5 Km and completing it strong and received his first Marathon D2D Medal. The Guest of Honor was Dr. C. Sylendra Babu IPS, ADGP, Coastal Security Group, Tamil Nadu, Mr. Vikram Cotah, COO, GRT Hotels & Brand Ambassador of D2D Marathon, Dr. Kannan Pugazhendi, Director, Sparrc Institute & Brand Ambassador of D2D Marathon, also participated in the run. Actor Surya after completing his 5km run said that he was delighted to be a part of this exciting event and was thrilled to participate in the D2D marathon and complete the 5km run. Moreso, this brings people together and makes them contribute for a worthy cause like educating the poor children. He said - In the years to come more and more people should participate in D2D and make it the popular running event in the night. “There were two events organized. The first being the cycling event, which was flagged off by Mr. Suman Voora, President, Round Table India, Mr. Mahendra Mullath, Partner - Just Buy Cycles, Mr. Inder Singh, Area 2 Chairman, Round Table India. The cycling event was for 25 Km / 50 Km / 100 Km / 100 plus km. Around 650 enthusiastic people braved the scorching heat and participated in this occasion. An organization of non-political and non-sectarian young men between the age group of 18-40 Years. Round Table India’s aim is to promote service, fellowship and goodwill in National and International affairs. Since 1997 Round Table India Under Freedom Through Education has built 5108 Classrooms in 1811 Schools at a total outlay of 152.54 Crores impacting 5.62 million Children and the numbers are still ticking every day. There are totally around 275 Tables all over India dedicated to this noble cause. Round Table India Highest Per Capita contribution to Society – more than Rs. 50000/- per member. D2D has been associating with Chennai Runners, Dream Runners, Cool Runners and Chennai Trekking Club since its inception in 2012. The entire community has shown large support to the event and these are highly motivating and enthusiastic running groups creating awareness to stay healthy through the sport of running. These running groups have motivated and inspired thousands of good souls to keep fit and healthy!